Icelandic Gambit - Chess Gambits- Harking back to the 19th century! This gambit arises following the moves 1.e4 d5 2.exd5 Nf6 3.c4, whereupon Black plays 3...e6. 3.c4 is often used as a transpositional device rather than as a way of trying to hold onto the d5-pawn, since after 3...c6, 4.dxc6?! Nxc6 gives Black excellent compensation for the pawn, keeping White's d2-pawn backward by taking control of the d4-square, and Black also gets very strong piece play. The problem with 3...c6 is 4.d4 which transposes to the Panov Attack of the Caro-Kann Defence (1.e4 c6 2.d4 d5 3.exd5 cxd5 4.c4) which gives White some chances of a small edge, typically in positions with an isolated pawn on d4 but compensatory attacking chances. But with 3...e6, Black denies White that transposition. The line with 3...e6 is mostly known as the Icelandic Gambit, and hence I have titled this page accordingly, although there is a strong case for naming it the Palme Gambit after Rudolf Palme (1910-2005), who was the first to introduce the gambit into master play, as pointed out by Stefan Bücker in Kaissiber 32. White can still decline the gambit by transposing to a line of the French Defence, Exchange Variation with 4.d4, but that line is generally considered to be equal with best play. Thus theoretically critical is 4.dxe6 Bxe6. White then generally chooses between 5.d4 and 5.Nf3 intending 6.d4, to prevent Black from making White's d2-pawn backward, and 5.Nf3 is the more critical of the two options. 1. 4.dxe6 Bxe6 5.d4. An attractive win by Julian Hodgson. In general Black is doing very well after 5...Bb4+ 6.Bd2 (6.Nc3 Ne4) 6...Qe7 (6...Bxd2+ 7.Qxd2 Qe7 is also good) 7.Bxb4 Qxb4+ 8.Qd2 and Black chooses between 8...Nc6, and 8...Qe7 transposing to 6...Bxd2+ lines. 2. 4.dxe6 Bxe6 5.Be2. I also take a quick look at 5.Nc3. White doesn't bother too much about the d2-pawn being left backward and concentrates on solid development. Again, Black doesn't have many problems getting enough for the pawn. 3. 4.dxe6 Bxe6 5.Nf3. This is the most challenging variation. Here 5...Nc6 is less effective because of 6.d4 and if 6...Bb4+ 7.Nc3 Ne4 8.Bd2 and the f3-knight does a good job of guarding d2 and d4. 5...c5 and 5...Qe7 both tend to lead to a quick queen exchange, but Black's activity comes close to providing full compensation for the pawn, though I think objectively White can get an edge in both cases. 4. 4.d4. A quick look at some relevant lines in the Exchange French. 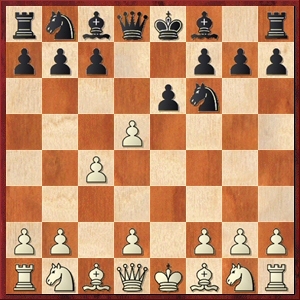 "Isolated queen's pawn" positions generally result, with equal chances for both sides. 5. 4.Nc3. Finally a look at some minor ways of declining which leave White at risk of ending up with a worse game.